This page is just a start. I want to better understand some of the inter-relationships of JACKSONs who held lands in Co. Donegal & Co. Londonderry. I do not yet know how Beresford JACKSON (1668-bet 1723-1730) came to own these lands in Co. Donegal.. They may have come from his wife Isabella, or from his mother Susan BERESFORD (?-1706). At present, I doubt that they came from his father William JACKSON (1628-1688) of Coleraine. There will be likely clues in my Draft Beresford Family Tree because there are links there also to the WRAY family. Updated February 27, 2019. Referenced parish and townland names beneath the map. NOTE: The few footnotes are just a start. I have shaded in those parishes mentioned in the deeds beneath. Some relate to holdings of Bereford JACKSON. Some to the WRAY family. RANKINs and CARYs are also of interest, as is the family of Bradwardine JACKSON and the HAMILTON connections. 1710 Will of William WRAY. NOTE: ARDS HOUSE (Home of WRAYs) , Creeslough, Parish Clondahorky County donegal, was formerly the seat of the Wray family. This is a long shot – only included in case it is Fore – William WRAY of Fore. 1710 1710 Will of William WRAY. 1719 Beresford JACKSON of Ballymarghy. Collonel Henry HART[E] was of Muff& Kilderry, Co. Donegal. His will was proved in 1712. His wife was Anne BERESFORD, daughter of Sir Tristram BERESFORD. NOTE: Ards Friary. John Wray, the first to come to live in Ireland, had been in the British Army. Once here he quickly established himself as a man seeking prominence and prestige. He was for a time Alderman of Derry. As usually happened to those who yielded useful loyalty and service to Her Majesty, Wray was generously endowed with valuable lands in not one, but a number of parts of Donegal, including 1000 acres at Carnagillagh, as well as holdings at Muff and Burt. Townlands in the Parish of Conwal held by Beresford JACKSON in the early 1700s are in black. Other townland names, included for context, are in red. NOTE: Maghernagran is to the west of this map, and Kilmacreddan in the Parish of Inver, Barony of Banagh is to the North of Ballynascaddan. Will of William WRAY of Fore, Donegal. Mention made of Jean JACKSON’s marriage articles with Henry WRAY. Will of William WRAY, Fore, County Donegal, Esq. To be buried in church of Clandahorkae [Clondahorky]. Wife Angel WRAY. Son Humphrey WRAY. Articles made on the marriage of my son Humphrey WRAY with Mrs. Ann BROOKE. Articles of marriage of my son Henry WRAY with Mrs. Joan JACKSON. Sons in law James SINCLAIR, gent, and George KNOX. Daughter Rebecca BABINGTON. Grandson's William and Henry BABINGTON. The heirs of Richard PORTER, deceased. John RICHARDSON, Kill. My servant, Samuel DENSMORE. Servant Thomas BLAIRE, Fore. Mrs. Ann SINCLAIR. Capt. Henry HART. William FINLAY, Drumnatinny. Estate purchased by Hugh HAMILL and William SAMPSON, esquires. Sale of Grenforth estate from William GODFREY, Benjamin GALLAND and my son-in-law Capt. William BABINGTON deed. With payments to Mr. John HUMBLE, John EVANS, and Capt. George HAMILTON. Trinamulland, Greenforth [Grenforth] [Greenfort, Greenfort Demesne, Parish Clondavaddog, Barony Kilmacrenan] Co. Donegal), Urney, Raymmunterdawney, Brunleck and Glassagh. Castlewray [Parish of Aghanunshin,, Barony Kilmacrenan], Clandormount (situation not mentioned). Fore, Co, Donegal. WITNESSES: George KNOX, Pattrick DENSMOORE, Samuel DENSMOORE. Memorial witnessed by Humphrey WRAY, George KNOX, Thomas KNOX. Samuel DENMOORE seal. NOTE: In abt 1705, Henry WRAY (1669-1737) married Jane JACKSON (1684-1744), daughter of Susan BERESFORD (?-1706) & William JACKSON (1628-1688). for the £107 owing to Beresford JACKSON of Ballymarghy [aka Bellarena, Parish Magilligan. [aka Tamlaghtard?] 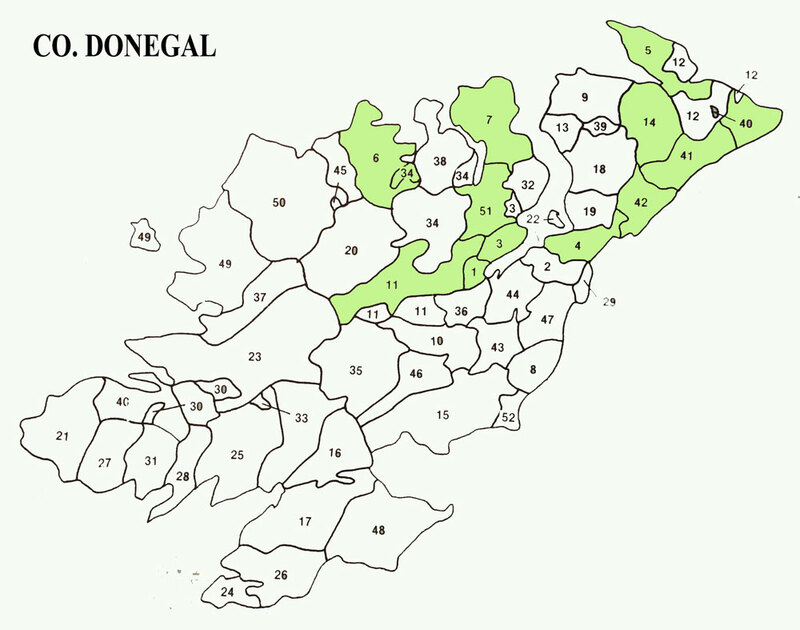 Barony Keenaght], Londonderry, John RANKAN [aka RANKIN] of Green Castle, Donegal to Beresford JACKSON for land of Carrortrasna [Carrowtrasna, Parish Moville Lower, in the Barony Inishowen East], in Manor of Green Castle, Barony Inishowen [Co. Donegal] for remainder of term of lease he held from Arthur CHICHESTER, proviso for redemption 2 Aug next. NOTE: This is the Beresford JACKSON son of William JACKSON (1628-1688) and Susan BERESFORD (?-1706). In TGF Paterson Book 135 at Armagh County Museum, there are notes of an indenture on 4 Aug 1714 btw Beresford JACKSON late of Ballymargay, Co. Londonderry Gent & Henry WRAY of Castle Wray. [Castlewray [Parish of Aghanunshin,, Barony Kilmacrenan], Co. Donegal Esq. & Jane his wife (sister of Beresford) sells lands of Machronnon alias Mackroharnan, Gortlee, Carnamughagh, Bollencessuddan, Killalastin and tenements of Letterkenny … lying in Barony of Kilmkrennan, Co. Donegal to Henry WRAY. 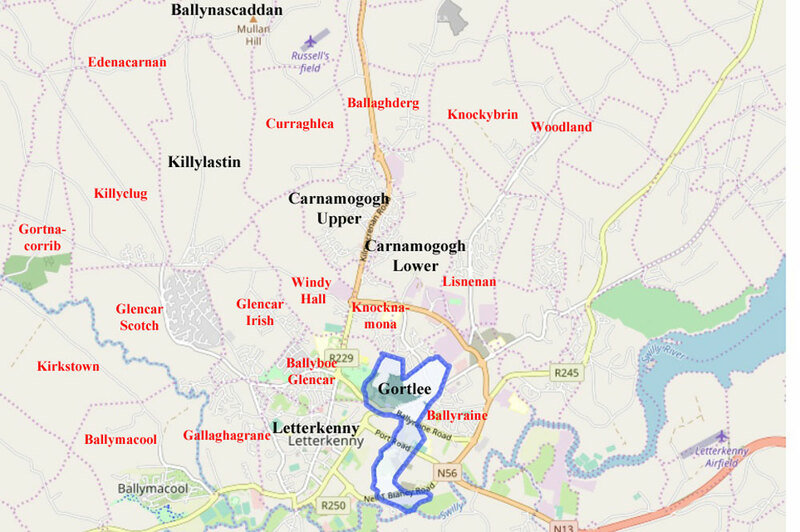 NOTE: Maghernagran, Gortlee, Carnamogagh Lower, & Carnamogagh Upper, Killylastin,, and Letterkenny, are all in the Parish Conwal, Barony Kilmacrenan, Co. Donegal. NOTE: Nichola Anne Cecil HAMILTON (?-1804), the daughter of Arthur CECIL-HAMILTON of Castle Hamilton married Richard JACKSON (1722-1787) of Forkhill Lodge. NOTE: This deed is lengthy – and I did not capture all of it, nor can I vouch for all the spelling of names and places. A copy is also at PRONI D509/45. Plaintiffs: Katherine [Chichester] dowager Countess of Donegall, Ireland and Hon John Chichester, esq (younger son of Arthur [Chichester] late earl of Donegall, deceased and said Katherine [Chichester] Countess of Donegall his wife) infant (by his mother). Defendants: Arthur [Chichester] Earl of Donegall and Lucy Londonderry, Thomas Coote, esq, Hans Hamilton, esq, Sir Peirce Butler bart, Robert Tench, esq, Thomas Vigors, James [Barry] Earl of Barrymore, Sir Bradwardine Jackson, Richard Booth, esq, Thomas Hutton, esq, Adam [Ottley] Bishop of St Davids and Richard [Temple] Baron of Cobham. Date of bill (or first document): 1718 [Chichester] Countess of Donegall his wife, Lucy [Ridgeway] dowager Countess of Londonderry, Thomas Coote, esq, Hans Hamilton, esq, Sir Peirce Butler bart, Robert Tench, esq, Thomas Vigors, James [Barry] Earl of Barrymore, Sir Bradwardine Jackson, Richard Booth, esq, Thomas Hutton, esq, Adam [Ottley] Bishop of St Davids and Richard [Temple] Baron of Cobham. NOTE: I am curious about the involvement of Bradwardine JACKSON (b abt 1670). It may be the BOOTH or OTTLEY connection. NOTE: Sir Bradwardine JACKSON (1670-btw 1727-1739) left no heir. Sir Arthur Chichester (1695-1757) was the husband of his half niece, Lucy RIDGEWAY. Lucy TINDALL had married firstly Sir John JACKSON and then Sir William JOPSON. Sir Bradwardine JACKSON (1670-btw 1727-1739) was the son of Sir John JACKSON and Lucy JOPSON, daughter of Sir William JOPSON was the mother of Lucy RIDGEWAY. SEE: JACKSONs of Edderthorpe, in Yorkshire, England. This family had numerous marriage and property connections to various places and families in Ireland. Deed Beresford JACKSON late of Bellymargy [aka Bellarena, Parish Magilligan. [aka Tamlaghtard?] Barony Keenaght], Co. Londonderry, Gent of 1st part & Henry WRAY of Castlewray, Co. Donegal, Esq. & Jane his wife of the other part (land in Donegal transferred). Beresford JACKSON late of Bellymargy Co. Londonderry, Gent to Henry WRAY of Castlewray, Co. Donegal, Esq. & Jane his of Machrecannon ats Mahreheran [Maghernagran] Gortles [Gortlee] Carnamughogh [Carnamogagh Lower, & Carnamogagh Upper] Bellinascadden [Bellanascaddan] Killacasting [Killylastin] one tenement in Litterkenny [Letterkenny] in possess' of James SAWYERS & one tenement in same in possess'n of Widow ORRAL, in Killmacrenah [Kilmacrennan]Co Donegal [no term or rent shown]. Registrars: Jon DARCES, John WOOTOON & Charles NORMAN. Witnesses: Thomas SKIPTON, Esq. of Ballyshashy, Londonderry; James WILSON, servant to Henry WRAY & Mary DUFFY. SEE: Descendants of William WRAY [Jane JACKSON was the wife of Henry WRAY] and JACKSONs of Coleraine. · Terry I do not know what this refers to. Although there is a Terrydrum, Parish of Tamlaght Finlagan, Barony Keenaght, Co. Londonderry, I suspect that it is part of the Eleven Ballyboes, Parish Moville Lower..
· Clare,, Parish Moville Upper. Capt. Henry HART I have him as Col. Henry HARTE. Andrew FERGUSON was a merchant of Coleraine whose will was proved in 1766. Collonel Henry HART[E] was of Muff & Kilderry, Co. Donegal. His will was proved in 1712. His wife was Anne BERESFORD, daughter of Sir Tristram BERESFORD and Sarah SACKVILLE. Their son George HARTE (1685-1758) was of Kilderry, Co. Donegal. The parents of Collonel Henry HART[E} (?-1712) were George HART and Elizabeth CARY. She was a daughter of George CARY (d 1640) & Jane BERESFORD (b abt 1605). Jane BERESFORD was a daughter of Tristram BERESFORD & Susannah BROOKE.